24 Medical Construction & Design | SEPTEMBER /OCTOBER 2016 | MCDM AG.COM One crucial area in which the built environment has direct impact on care delivery is in the eff ective management of infection control. From structural and interior space design to the technologies and materials used within it, the built environment can signifi - cantly help reduce the spread of infection. Infection prevention is central to both quality of care and hospital economics. Infec- tions can be serious and even life-threatening. Patients in an immuno-suppressed state or on heavy antibiotics are espe- cially susceptible to infection. Infections are also expensive to treat. According to the U.S. Centers for Disease Control and Prevention, the cost of healthcare-associated infec- tions patients acquire after they've been admitted to the hospital is almost $10 billion a year, with one out of every 20 patients admitted to a hospital getting an infection they pick up while there. Innovations in design, technologies and materials can have a major impact in reduc- ing these hospital-associated infections. The move toward private rooms is largely driven by clear evidence that they greatly reduce the spread of infection, as patients and visitors do not share space and equipment with other pa- tients. However, even within a private room, many infection hazards remain. 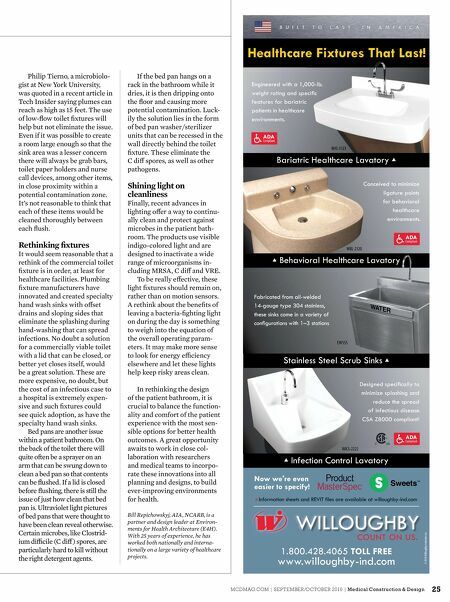 One of the areas that might be due for a rethink is the patient bath- room. The design of any private patient room always involves a balancing act between the amount of space devoted to the caregiver area, the patient area, the family space and the bathroom. The bathroom space, in particular, is often under pressure to utilize as little space as possible within the overall footprint of the room while still remaining functional. This has led to the wide adoption of the Europe- an-style shower confi guration where the curtain defi nes the shower area rather than a shower stall with a raised lip. 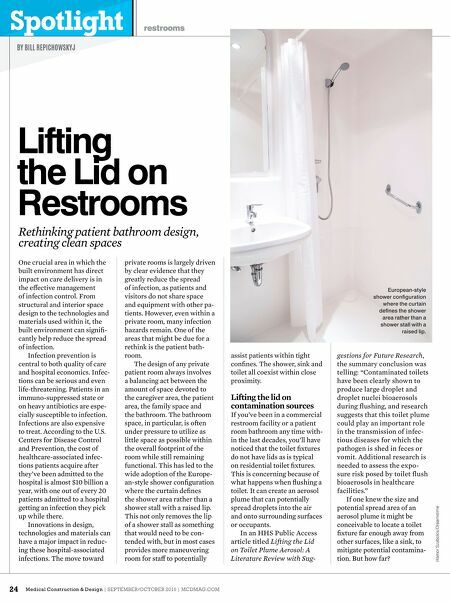 This not only removes the lip of a shower stall as something that would need to be con- tended with, but in most cases provides more maneuvering room for staff to potentially assist patients within tight confi nes. The shower, sink and toilet all coexist within close proximity. Lifting the lid on contamination sources If you've been in a commercial restroom facility or a patient room bathroom any time with- in the last decades, you'll have noticed that the toilet fi xtures do not have lids as is typical on residential toilet fi xtures. This is concerning because of what happens when fl ushing a toilet. It can create an aerosol plume that can potentially spread droplets into the air and onto surrounding surfaces or occupants. In an HHS Public Access article titled Lifting the Lid on Toilet Plume Aerosol: A Literature Review with Sug- gestions for Future Research, the summary conclusion was telling: "Contaminated toilets have been clearly shown to produce large droplet and droplet nuclei bioaerosols during flushing, and research suggests that this toilet plume could play an important role in the transmission of infec- tious diseases for which the pathogen is shed in feces or vomit. Additional research is needed to assess the expo- sure risk posed by toilet flush bioaerosols in healthcare facilities." If one knew the size and potential spread area of an aerosol plume it might be conceivable to locate a toilet fi xture far enough away from other surfaces, like a sink, to mitigate potential contamina- tion. But how far? Rethinking patient bathroom design, creating clean spaces Lifting the Lid on Restrooms Spotlight restrooms BY BILL REPICHOWSKYJ g Hámor Szabolcs/Dreamstime European-style shower confi guration where the curtain defi nes the shower area rather than a shower stall with a raised lip.